WASHINGTON — Republicans in Congress appear closer to reaching a compromise on immigration — and ending family separations at the Texas-Mexico border — after a closed-door meeting with President Donald Trump Tuesday evening. But multiple House Republicans said Tuesday night they are unsure they'll have the votes to pass a bill, Politico reported. Trump, who has repeatedly blamed Congress for his administration’s “zero tolerance” policy, encouraged House Republicans to pass a modified version of a compromise bill Republican leaders introduced last week. 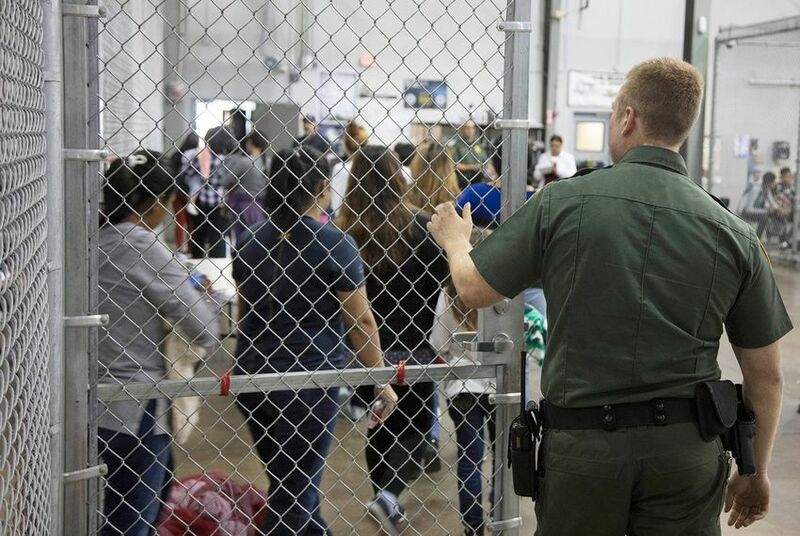 That updated version would include a provision that would keep immigrant families together as they await court hearings, according to lawmakers who attended the meeting Tuesday. For days, photos of detained immigrant children have streamed out of South and West Texas, upending the workflow in Washington in a way not seen since the travel ban early in the Trump administration. Despite growing Republican criticism out of the Senate — including from Texas' two GOP senators — White House officials have dug in on their policy of separating immigrant children from their parents. "The answer to this current situation is a solution that allows us to both enforce the law and keep families together," U.S. Sen. John Cornyn said Tuesday on the Senate floor. "They don't have to be mutually exclusive." He said he agreed with former first lady Laura Bush that there should be "a better answer." Bush is among a chorus of voices of criticizing the policy — a group that includes the other living first ladies. Cornyn has said in recent days that he intends to introduce legislation that will keep families together and expedite hearings. On Tuesday evening, U.S. Sen. Ted Cruz introduced emergency legislation that would marshal more resources to the border to expedite the legal process for immigrants seeking asylum and create facilities that would allow parents to stay with their children. Earlier Tuesday, he confirmed a report from The Washington Post that he was working together with Cornyn on a bill that could be filed later in the day. Cornyn was not listed among the co-sponsors of the bill, but a spokesperson told the Tribune that the two senators are still working together. Asked about working with Cruz on the legislation, Cornyn said the bill Cruz has been working seems to contain the elements "of a consensus approach" and said he aims to work with Democrats on a bipartisan solution. At a press conference later in the day, Senate Majority Leader Mitch McConnell stood next to Cornyn as he said "all of the members of the Republican conference support a plan that keeps families together while their immigration status is determined." He said Republicans hope to reach out to Democrats to "see if we can get a result." But in a speech Tuesday afternoon, Trump appeared to shoot down at least one element of Cruz's proposed emergency bill — an idea to double the number immigration judges from roughly 375 to 750. "We have to have a real border, not judges," Trump said, adding that some judges might be corrupt. Immigration is poised to dominate congressional action this week, as the House is set to pick up two Republican pieces of related legislation on Thursday. Those bills — both of which face uphill battles in the House and the Senate — will address Trump's long-sought border wall and what to do with the Deferred Action for Childhood Arrivals program, an Obama-era immigration measure that protects hundreds of thousands of young undocumented immigrants from deportation. The more moderate bill, which provides a conditional pathway to citizenship for certain qualifying undocumented youth and addresses the family separation issue, got a boost Tuesday after Trump told lawmakers he supported the proposal. The president’s remarks appear to have convinced a number of Republicans who were previously leaning toward a more conservative bill authored by Texan U.S. Rep. Michael McCaul of Tomball and Rep. Bob Goodlatte of Virginia. Several Texas Republicans exiting the meeting Tuesday voiced support for the compromise bill and optimism that it would garner the 218 votes it needs to pass. Brady said Trump endorsed provisions in the bill that addressed the family separation question. Specifically, those measures would allow families to stay together as they undergo immigration proceedings and would allocate $7 billion in federal funds for family detention centers. Brady said those provisions “drew strong support” from House Republicans in the room. U.S. Rep. Kay Granger, R-Fort Worth, said she will vote for the compromise bill. “It will keep the families together,” she said. The outcry is so widespread on Capitol Hill that it worked its way into a high-profile Tuesday morning committee hearing on the FBI's actions in the 2016 Clinton email investigation. House Democrats veered off topic during the hearing to decry the policy as Republicans grumbled "Out of Order!" The images of crying children at the border are beginning to spook Republican political consultants, who fear they could impact the GOP's chances of holding the lower chamber after this fall's midterm election. At the same time, it was only one week ago that U.S. Rep. Mark Sanford, R-South Carolina, lost his primary. President Donald Trump specifically targeted him for past critical comments and reinforced the fears many Texas Republicans and their advisers of crossing the president. The calls against Trump from that chamber remained largely muted in recent days, and when the The Texas Tribune surveyed the Texas delegation Monday, many Texas Republicans avoided commenting on the matter. Trump’s endorsement of the compromise bill Tuesday evening seems to have provided political cover for vulnerable Republicans to get behind the legislation and speak out about the family separations. U.S. Rep. John Culberson, R-Houston, who is facing a tough re-election fight, said he was “very encouraged” by the meeting. “It’s got all the right elements that we need to secure the border, to make sure we’re taking care of the DACA problem, to make sure that the families aren’t separated,” he said. But the Tuesday meeting did not convince everyone. U.S. Rep. Pete Sessions, R-Dallas, is among the holdouts still supporting the Goodlatte-McCaul bill. U.S. Rep. Mike Conaway, R-Midland, said Republicans were still trying to whip up the votes Tuesday evening to pass the compromise measure and that it is unclear when that bill will come up for a vote. The House will likely vote on the more conservative Goodlatte-McCaul bill Thursday.